Are you in search for healthy lunches for kids? Do try this fried rice recipe just in 30 minutes. Few leftovers with some veggies in your fridge can make a great dinner meal or lunchbox meal. One of the simple and filling leftover rice recipes. It is something messy to eat the leftover dried out the unappealing mass of cold rice which you had for dinner the previous day. No one loves to eat day old rice on its own. But there is some perfect technique to turn them into a wonderful lunch meal the next day. Unfortunately, the best perfect fried rice is made with cooled rice (long grain rice) which results in crispy nicely separated grains rather than a sticky freshly cooked rice. 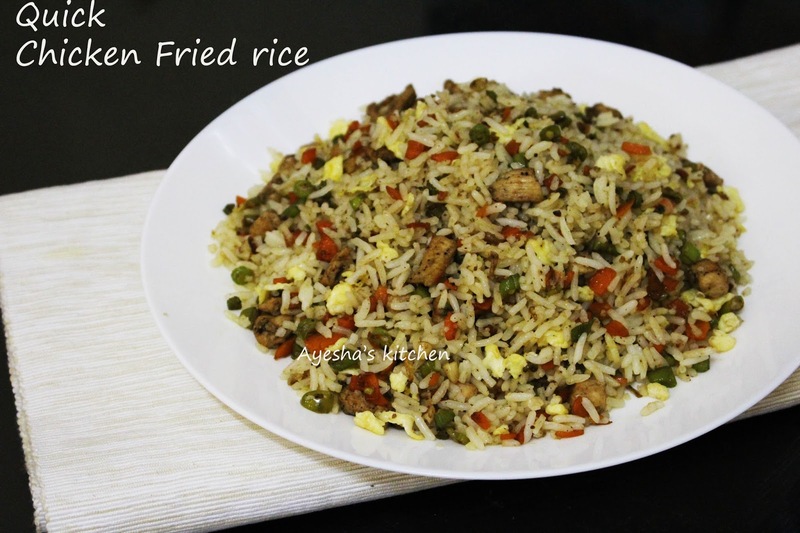 Do try this delicious chicken fried rice which is the great way to use left over rice. The combination of some colorful veggies, cooked chicken, and scrambled egg along with some spices for the flavor together makes a quick scrumptious lunch for sure. Here is the recipe showing how to make quick fried rice / cooked rice recipes / simple rice recipes / cooked basmati rice recipe / cold rice recipes /leftovers. Set all the ingredients ready. Chop the carrot and french beans or any vegetable and set it ready. You can chop it ahead of time or can use frozen vegetables for a very quick fried rice recipe. Marinate the chicken cubes/slices / chunks and set aside. This also can prepare in advance and keep refrigerated. Heat vegetable oil/olive oil in a skillet or pan over a medium heat and then scramble the egg until done. Set it aside on a plate. To the same skillet or pan, add butter along with the marinated chicken cubes and toss it until done. Now add the chopped vegetables and saute for 3 minutes continuously or until vegetables begin to soften. Then add soy sauce, pepper powder, salt and combine well. Now add the cooled cooked rice and lightly toss it until it is well combined with vegetables and chicken. When done, stir in the scrambled egg and give a final toss. Remove from heat and can serve it as your quick lunch box meal/kids snack box / quick dinner recipes with the leftover. Do try ...it's really simple and scrumptious.